Speaking at a joint press conference with his Azeri counterpart Ilham Aliyev in Ankara, Turkish President Recep Tayyip Erdoğan announced the launch the Trans Anatolian Natural Gas Project (TANAP) to transport natural gas from Azerbaijan’s Shah Deniz-2 (SD2) gas field, and other areas of the Caspian Sea, primarily to Turkey, before it reaches Europe. The project is considered to strengthen the role of Turkey as a regional energy hub as well as touted as another milestone in Turkey-Azerbaijan relationship. The project's cost is estimated at U.S. $10-$11 billion. 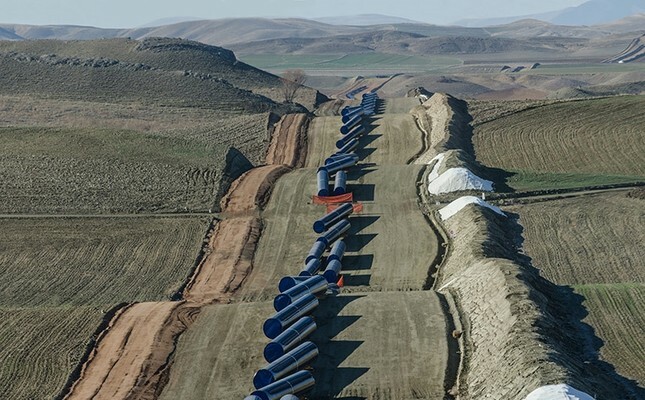 The construction of a 1,850-kilometer-long (1,149.5 mi), 56-inch and 48-inch, gas pipeline began formally in March 2015, will start operation at the end of June 2018, Hurriyet Daily News quoted the General Manager Saltuk Duzyol. TANAP is planned to begin from the Georgia/Turkey border and go through the provincial borders of Ardahan, Kars, Erzurum, Erzincan, Bayburt, Gümüşhane, Giresun, Sivas, Yozgat, Kırşehir, Kırıkkale, Ankara, Eskişehir, Bilecik, Kütahya, Bursa, Balıkesir, Çanakkale, Tekirdağ, and Edirne. TANAP connects to South Caucasus Pipeline (SCP) and ends at the Turkey/Greece border in İpsala/Edirne, where it feeds into the TAP Pipeline. There is an off-take station in Eskişehir, Turkey, and another one at Thrace, Turkey to connect to the Turkish natural gas distribution network. The pipeline system will initially transport 16 billion cubic meters per Annum (bcma) of Shah Deniz gas of which 6 billion bcma will be sold to Turkey and 10 bcma will be available for onward transmission to the European markets. Along with the SCP and the Trans-Adriatic Pipeline (TAP), TANAP is an important part of Southern Gas Corridor. The initial capacity of 16 bcma (First Stage) is expected to expand to 24 bcma by 2023 (Second Stage) and to 31 bcma by 2026 (Third Stage), upon the construction of the required additional compressor stations. On December 24, 2011, the Government of the Republic of Turkey and the Government of the Republic of Azerbaijan signed the Memorandum of Understanding between the State Oil Company of Azerbaijan Republic (SOCAR) within the framework of the TANAP Natural Gas Transmission Company. At the beginning of the Environmental and Social Impact Assessment (ESIA) process, the pipeline was planned to be divided into two branches after crossing the Marmara Sea and the second branch would pass Tekirdağ and enter Bulgaria through Kırklareli. However, due to the change in the marketing strategy of Azerbaijan, natural gas to Europe by the Bulgarian section was canceled. On February 25, 2014, South Gas Corridor CJSC, a closed Joint-Stock Company, formed under a decree signed by President of the Republic of Azerbaijan, to manage effective implementation of the full-field development of Shah Deniz gas-condensate field ("SD2"), South Caucasus Pipeline Expansion ("SCPX"), implementation of Trans-Anatolian Pipeline ("TANAP") and Trans Adriatic Pipeline ("TAP") projects. SGC was founded on 31 March 2014 by the Ministry of Economy of Azerbaijan Republic (51%) and SOCAR(49%). BP (formerly British Petroleum) – 12%*. *On April 16, 2015, BP purchased 12% of TANAP from the Southern Gas Corridor CJSC. Main design according to ASME B31.8, 2012. 7 compressor stations (2 at First Stage, 2 more at Second Stage, and 3 more2 at Third Stage) at intermediate points for fulfilling pressure requirements. A separate compressor train is foreseen for the gas supply to BOTAŞ in CST-5A (identified as CST-5AL). 1 delivery border metering station at the exit point. 49 in accordance with ASME B31.8, 2012 requirements. 2 in Turkey, with metering stations. Turkey was the first state to recognize Azerbaijan's independence in 1991 and has been a staunch supporter of Azerbaijan in its efforts to consolidate its independence, preserve its territorial integrity and realize its economic potential arising from the rich natural resources of the Caspian Sea. Both of the countries have subsequently built upon their linguistic and cultural ties to form a very close economic partnership such as the Baku–Tbilisi–Ceyhan pipeline, the South Caucasus Pipeline, Baku-Tbilisi-Kars (BTK) rail link and the proposed TANAP gas pipeline. "In such complex energy geopolitics or the "New Great Game", a special interdependent relationship between Turkey and Azerbaijan has evolved. The drivers of this partnership have been manifold, but most significantly they have included Turkey’s search for supply security and its ambitions for a hub role on the one hand, and Azerbaijan's quest to consolidate its independence through integration into trans-Atlantic structures on the other." says Prof. Şaban Kardaş, Associate Professor of international relations in the Department of International Relations at TOBB University of Economics and Technology, Ankara. The Baku–Tbilisi–Ceyhan (BTC) pipeline is a 1,768 kilometers (1,099 mi) long crude oil pipeline from the Azeri–Chirag–Gunashli oil field in the Caspian Sea to the Mediterranean Sea. It connects Baku, the capital of Azerbaijan and Ceyhan, a port on the south-eastern Mediterranean coast of Turkey, via Tbilisi, the capital of Georgia. It is the second-longest oil pipeline in the former Soviet Union, after the Druzhba pipeline. The first oil that was pumped from the Baku end of the pipeline reached Ceyhan on May 28, 2006. The South Caucasus Pipeline (SCP), also known as Baku–Tbilisi–Erzurum Pipeline, BTE pipeline, or Shah Deniz Pipeline – is a natural gas pipeline from the Shah Deniz gas field in the Azerbaijan sector of the Caspian Sea to Turkey. It runs parallel to the Baku–Tbilisi–Ceyhan crude oil pipeline. Following the first test run by a passenger train from Tbilisi to Akhalkalaki on September 27, 2017, the BTK rail link was inaugurated in the ceremony hosted by the President of Azerbaijan Ilham Aliyev in Alyat on October 30, 2017. The railroad directly connects Azerbaijan, Georgia, and Turkey. Besides BTK rail link, Azerbaijan has two major transportation infrastructure projects; the Baku International Sea Trade Port currently under construction; and the already completed upgrade of Heydar Aliyev International Airport. Do note, The EU refused to finance the Georgian part of BTK project, as it supported the re-opening of the Kars–Gyumri–Tbilisi railway line. The U.S. Congress prohibited the financing of the project by the American Export-Import Bank under pressure by the Armenian lobby.